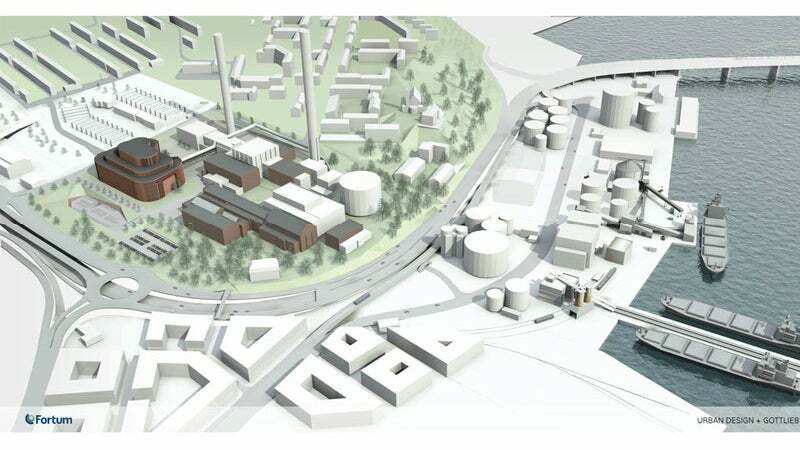 The Värteverken Biofuel Combined Heat and Power (CHP) Plant is touted to be the biggest facility of its kind in Sweden. Image: courtesy of Hans Ekestang. The architect for the main building was the joint venture of Urban Design, and Gottlieb Paludan Architects. Image: courtesy of Hans Ekestang. The project involved the construction of a 200m-long fuel loading pier and upgrade of the infrastructure at Värtan Energy Port. Image: courtesy of Hans Ekestang. Doosan Škoda Power supplied the plant’s steam turbine, generator, turbo-set control system, regeneration system and heaters. Image: courtesy of Fortum Corporation. The biofuel CHP plant will require approximately 12,000m³ a day of feedstock sourced from the forestry industry. Image: courtesy of Doosan Škoda Power. The Värteverken Biofuel Combined Heat and Power (CHP) Plant, dubbed KVV8, is located in Värtan, downtown Stockholm, Sweden. Its construction started in January 2013 and the final testing phase commenced in February 2016. The co-generation plant is being developed by Fortum Värtan, a 50:50 joint venture between Fortum and the City of Stockholm. It is part of Fortum’s Roadmap 2020, which is aimed at producing heat and electricity in Stockholm using 100% renewable resources by 2030. With an installed capacity of 280MW heat and 130MW electricity, it is touted to be the biggest facility of its kind in Sweden. The annual output capacity from the facility is rated at 750GWh electricity and 1,700GWh heat. The electricity produced from the facility will be conveyed to the existing Stockholm Southern-central district heating network, whereas the electricity will be conveyed to the public grid. The heat produced from the biofuel CHP facility will be capable of heating approximately 190,000 average size apartments and the facility is expected to offset 126,000t of carbon dioxide emissions a year. The construction phase of the new CHP plant generated between 800 and 1,000 jobs, while 35 permanent jobs are expected to be generated for the operations and maintenance of the facility. The main process building is equipped with a PowerFluid fluidised bed boiler, a flue gas cleaning plant, a steam turbine, a generator, turbo-set control system, regeneration system, heaters for hot water heating, and electrical and control systems. Other ancillary facilities include a feedstock sift and crushing building, a 50,000m³ underground fuel storage facility, underground tunnels integrating a transportation belt to convey the feedstock to the process plant, an ash silo, and biofuel storage facilities. The project also involved the construction of a 200m-long fuel loading pier and upgrade of infrastructure at Värtan Energy Port, with the inclusion of fuel storage and handling facilities. The main building has a curving façade, constructed of terra cotta elements, wrapping the entire building independently. The CHP plant will utilise feedstock including chips, bark, branches, tops and twigs sourced from Scandinavia, the Baltic countries and Russia. It has a feedstock processing capacity of approximately 12,000m³ a day and therefore requires delivery using three to four ships and five trains a week. The feedstock transportation by trains will be handled by Hector Rail, as part of a five-year agreement, whereas the transportation of the feedstock by ships will be performed by ASPO Group’s ESL Shipping. "The overall investment in the project is estimated to reach SEK 4.4bn ($517m approximately)." Andridtz was contracted to supply the boiler and the flue gas cleaning system and the associated electrical and control systems. It further subcontracted Radscan Intervex to supply the flue gas condensation plant. Consulting services during the installation of these components were rendered by JD-Gruppen. The steam turbine, generator, turbo-set control system, regeneration system and heaters were supplied and installed by Doosan Škoda Power, who is also responsible for the commissioning. It further subcontracted ORAB Construction to assemble the turbine’s pipe components. The main construction contractor for the project was JM Construction. The measurement services for the complex were performed by Geoteam under a subcontract from JM Construction. The architect for the project was the joint venture of Urban Design, and Gottlieb Paludan Architects. The 3D building information model was created by Stig Bengtsson Architect. Cargotec supplied an electrically-powered, gantry-based, ATEX-classified Siwertell 15 000 S unit ship unloader, which has a rated capacity of 300t an hour. The anchor bolts, hidden corbels, fastening plates and rebar couplers were supplied by Peikko Group. The overall investment in the project is estimated to reach SEK 4.4bn ($517m approximately). The European Investment Bank (EIB) is providing a €260m (4287m approximately) loan, whereas the Nordic Investment Bank (NIB) is providing a €155m ($177m approximately) loan.